I’d promised on Sunday the remainder of last week’s mathematically-themed comic strips. I got busy with house chores yesterday and failed to post on time. That’s why this is late. It’s only a couple of comics here, but it does include my list of strips that I didn’t think were on-topic enough. You might like them, or be able to use them, yourself, though. Niklas Eriksson’s Carpe Diem for the 14th depicts a kid enthusiastic about the abilities of mathematics to uncover truths. Suppressed truths, in this case. Well, it’s not as if mathematics hasn’t been put to the service of conspiracy theories before. Mathematics holds a great promise of truth. Answers calculated correctly are, after all, universally true. They can also offer a hypnotizing precision, with all the digits past the decimal point that anyone could want. But one catch among many is whether your calculations are about anything relevant to what you want to know. Another is whether the calculations were done correctly. It’s easy to make a mistake. If one thinks one has found exciting results it’s hard to imagine even looking for one. Niklas Eriksson’s Carpe Diem for the 14th of February, 2019. Essays expanding on something mentioned in Carpe Diem should be at this link. You can’t use shadow analysis to prove the Moon landings fake. But the analysis of shadows can be good mathematics. It can locate things in space and in time. This is a kind of “inverse problem”: given this observable result, what combinations of light and shadow and position would have caused that? And there is a related problem. Johannes Vermeer produced many paintings with awesome, photorealistic detail. One hypothesis for how he achieved this skill is that he used optical tools, including a camera obscura and appropriate curved mirrors. So, is it possible to use the objects shown in perspective in his paintings to project where the original objects had to be, and where the painter had to be, to see them? We can calculate this, at least. I am not well enough versed in art history to say whether we have compelling answers. Art Sansom and Chip Sansom’s The Born Loser for the 16th of February, 2019. I had thought this might be a new tag, but, no. Born Loser comics get discussed at this link. Art Sansom and Chip Sansom’s The Born Loser for the 16th is the rare Roman Numerals joke strip that isn’t anthropomorphizing the numerals. Or a play on how the numerals used are also letters. But yeah, there’s not much use for them that isn’t decorative. Hindu-Arabic numerals have great advantages in compactness, and multiplication and division, and handling fractions of a whole number. And handling big numbers. Roman numerals are probably about as good for adding or subtracting small numbers, but that’s not enough of what we do anymore. And past that there were three comic strips that had some mathematics element. But they were slight ones, and I didn’t feel I could write about them at length. Might like them anyway. Gordon Bess’s Redeye for the 10th of February, and originally run the 24th of September, 1972, has the start of a word problem as example of Pokey’s homework. Mark Litzler’s Joe Vanilla for the 11th has a couple scientist-types standing in front of a board with some mathematics symbols. The symbols don’t quite parse, to me, but they look close to it. Like, the line about is close to what one would write for the Fourier transformation of the function named l. It would need to be more like and even then it wouldn’t be quite done. So I guess Litzler used some actual reference but only copied as much as worked for the composition. (Which is not a problem, of course. The mathematics has no role in this strip beyond its visual appeal, so only the part that looks good needs to be there.) The Fourier transform’s a commonly-used trick; among many things, it lets us replace differential equations (hard, but instructive, and everywhere) with polynomials (comfortable and familiar and well-understood). Finally among the not-quite-comment-worthy is Pascal Wyse and Joe Berger’s Berger And Wyse for the 12th, showing off a Venn Diagram for its joke. Next Sunday should be a fresh Reading the Comics post, which like all its kind, should appear at this link. That there were twelve comic strips making my cut as mention-worthy this week should have let me do three essays of four comics each. But the desire to include all the comics from the same day in one essay leaves me one short here. So be it. Three of the four cartoonists featured here have a name of Sansom or Samson, so, that’s an edition title for you. No, Sam and Silo do not appear here. Art Sansom and Chip Sansom’s Born Loser for the 6th uses arithmetic as a test of deference. Will someone deny a true thing in order to demonstrate loyalty? Arithmetic is full of things that are inarguably true. If we take the ordinary meanings of one, plus, equals, and three, it can’t be that one plus one equals three. Most fields of human endeavor are vulnerable to personal taste, or can get lost in definitions and technicalities. Or the advance of knowledge: my love and I were talking last night how we remembered hearing, as kids, the trivia that panda bears were not really bears, but a kind of raccoon. (Genetic evidence has us now put giant pandas with the bears, and red pandas as part of the same superfamily as raccoons, but barely.) Or even be subject to sarcasm. Arithmetic has a harder time of that. Mathematical ideas do evolve in time, certainly. But basic arithmetic is pretty stable. Logic is also a reliable source of things we can be confident are true. But arithmetic is more familiar than most logical propositions. Art Sansom and Chip Sansom’s Born Loser for the 6th of December, 2018. Essays about the topics raised by The Born Loser should be at this link. I’m startled to discover this is apparently a new tag, though. Samson’s Dark Side of the Horse for the 8th is the Roman Numerals joke for the week. It’s also a bit of a wordplay joke, although the music wordplay rather tha mathematics. Me, I still haven’t heard a clear reason why ‘MIC’ wouldn’t be a legitimate Roman numeral representation of 1099. I’m not sure whether ‘MIC’ would step on or augment the final joke, though. Samson’s Dark Side of the Horse for the 8th of December, 2018. This and other essays mentioning Dark Side Of The Horse are at this link. This is certainly not a new tag. Pab Sungenis’s New Adventures of Queen Victoria for the 8th has a comedia dell’arte-based structure for its joke. (The strip does that, now and then.) The comic uses a story problem, with the calculated answer rejected for the nonsense it would be. I suppose it must be possible for someone to eat eighty apples over a long enough time that it’s not distressing, and yet another twenty apples wouldn’t spoil. I wouldn’t try it, though. Pab Sungenis’s New Adventures of Queen Victoria for the 8th of December, 2018. Essays based on stuff mentioned in New Adventures of Queen Victoria should be at this link. This also seems to be a new tag, somehow, and that doesn’t make sense to me. This and my other Reading the Comics posts should all be available at this link. There are times I feel like my writing here collapses entirely to Reading the Comics posts. It’s a temptation to just give up doing anything else. They’re easy to write, since the comics give me the subjects to discuss. And it offers a nice, accessible mix of same-old topics with the occasional oddball. It’s fun. But sometimes Comic Strip Master Command decides I’ve been doing enough of that. This is one of those weeks; I only found six comics in my normal reading that were on point enough to discuss. So here’s half of them. Bill Rechin’s Crock for the 6th is … hm. Well, let’s call it a fractions joke. I’m curious exactly what the clerk’s joke is supposed to mean. Is it intended to suggest an impossibility, putting into something far more than it can hold? Or is it just meant to suggest gross overabundance? And deep down I suspect Rechin didn’t have any specific meaning; it’s just a good-sounding insult. Bill Rechin’s Crock rerun for the 6th of August, 2018. At least I believe this to be a rerun; Rechin died in 2011. But then I had understood the comic was supposed to continue running until 2015 to satisfy some outstanding contracts and then cease. It’s been more than three years. I have no explanation for this phenomenon. Hector D Cantu and Carlos Castellanos’s Baldo for the 7th is … hm. Well, let’s call it a wordplay joke. It works by “strength” having multiple meanings, and “numbers” having multiple meanings. And there being a convenient saying to link one to the other. If this were a busier week I wouldn’t even bring it up, but I hate going without anything around here. Hector D Cantu and Carlos Castellanos’s Baldo for the 7th of August, 2018. Yes, I see you complaining that the pole can’t possibly hold up those two cartons of books as depicted. But if the books didn’t stand upright in the middle of the cartons then there’d be no telling that there was a substantial weight inside the cartons, defeating the joke before it has half a chance. Read generously. Keith Tutt and Daniel Saunders’s Lard’s World Peace Tips for the 8th is … hm. Well, let’s call it a Roman numerals joke. It’s really more wordplay. And one I like, although the pacing is off. The second panel could be usefully dropped, and you could probably redo this all in two panels — or one — to better effect. Keith Tutt and Daniel Saunders’s Lard’s World Peace Tips for the 8th of August, 2018. I do not understand the copyright information given here, but as one might have seen from my explorations of Gene Mora’s Graffiti , I don’t understand a lot of copyright information given on comic strips. They’ve been phasing Roman Numerals out for a long while. Arabic numerals got their grand introduction to the (Western) Roman Empire’s territories in 1202 by Leonardo of Pisa, known now as “Fibonacci”. His Liber Abaci ( Book of Calculation ) laid out the Arabic numerals scheme and place values, and how to use them. By 1228 he published an edition comparing Roman numerals to Arabic numerals. This wasn’t the first anyone in western Europe had heard of them, mind. (It never is; anyone telling you anything was the first is simplifying.) Spanish monks in the 10th century studied Arabic texts, and wrote about what they found. But after Leonardo of Pisa, Arabic numerals started displacing Roman numerals at least in specialized trades. Florence, in what is now Italy, prohibited merchants from using Arabic numerals in 1299; they could use Roman numerals or write them out in words. This, presumably, to prevent cheating by use of strange, unfamiliar calculus. Arabic numerals escaped being tools of specialists in the 16th century, thanks in large part to the German mathematician Adam Ries, who explained the scheme in terms apprentices could understand. Still, these days, a Roman numeral is mostly an affectation. Useful for bit of style; not for serious mathematics. Good for watches. Well. I keep all my Reading the Comics essays tagged so that you can read them at this link. Other essays that mention Crock should be available at this link. If you’re more interested in Baldo other essays mentioning it should be here. And other Lard’s World Peace Tips, when they inspire mathematical thoughts, are available at this link. Thank you. Can’t say this was too fast or too slow a week for mathematically-themed comic strips. A bunch of the strips were panel comics, so that’ll do for my theme. Norm Feuti’s Retail for the 21st mentions every (not that) algebra teacher’s favorite vague introduction to group theory, the Rubik’s Cube. Well, the ways you can rotate the various sides of the cube do form a group, which is something that acts like arithmetic without necessarily being numbers. And it gets into value judgements. There exist algorithms to solve Rubik’s cubes. Is it a show of intelligence that someone can learn an algorithm and solve any cube? — But then, how is solving a Rubik’s cube, with or without the help of an algorithm, a show of intelligence? At least of any intelligence more than the bit of spatial recognition that’s good for rotating cubes around? Norm Feuti’s Retail for the 21st of May, 2017. A few weeks ago I ran across a book about the world of competitive Rubik’s Cube solving. I haven’t had the chance to read it, but am interested by the ways people form rules for what would seem like a naturally shapeless feature such as solving Rubik’s Cubes. Not featured: the early 80s Saturday morning cartoon that totally existed because somehow that made sense back then. I don’t see that learning an algorithm for a problem is a lack of intelligence. No more than using a photo reference shows a lack of drawing skill. It’s still something you need to learn, and to apply, and to adapt to the cube as you have it to deal with. Anyway, I never learned any techniques for solving it either. Would just play for the joy of it. Here’s a page with one approach to solving the cube, if you’d like to give it a try yourself. Good luck. Bob Weber Jr and Jay Stephens’s Oh, Brother! for the 22nd is a word-problem avoidance joke. It’s a slight thing to include, but the artwork is nice. Brian and Ron Boychuk’s Chuckle Brothers for the 23rd is a very slight thing to include, but it’s looking like a slow week. I need something here. If you don’t see it then things picked up. They similarly tried sprucing things up the 27th, with another joke for taping onto the door. Nate Fakes’s Break of Day for the 24th features the traditional whiteboard full of mathematics scrawls as a sign of intelligence. The scrawl on the whiteboard looks almost meaningful. The integral, particularly, looks like it might have been copied from a legitimate problem in polar or cylindrical coordinates. I say “almost” because while I think that some of the r symbols there are r’ I’m not positive those aren’t just stray marks. If they are r’ symbols, it’s the sort of integral that comes up when you look at surfaces of spheres. It would be the electric field of a conductive metal ball given some charge, or the gravitational field of a shell. These are tedious integrals to solve, but fortunately after you do them in a couple of introductory physics-for-majors classes you can just look up the answers instead. Samson’s Dark Side of the Horse for the 26th is the Roman numerals joke for this installment. I feel like it ought to be a pie chart joke too, but I can’t find a way to make it one. Izzy Ehnes’s The Best Medicine Cartoon for the 27th is the anthropomorphic numerals joke for this paragraph. I haven’t got the chance to write a proper essay today, but did want to be sure people didn’t miss The Straight Dope this week. Cecil Adams gets the question “How did anyone do math in Roman numerals?” and does what he can to answer in a couple hundred words of newspaper space. It’ll disappoint you if you have visions of whipping through a quadratic equation written all in V’s and L’s and stuff. Roman numeral arithmetic is really easy for addition and subtraction. Multiplication and division turn into real challenges for which you need mechanical aid and the abacus. Adams describes this loosely, although not in enough detail that you’ll come away confident with your abacus. Fair enough. I’ve got a charming little abacus myself, someone’s gift to me, and I can’t use it even to the slight extent I can use a slide rule. The important thing, though, is that as a young know-it-all Cecil Adams’s first two books, The Straight Dope and The Return of the Straight Dope , were just magnificently important reading. Not as hefty as David Wallechinsky and Irving Wallace’s The People’s Almanac 2 , but with a much higher fascinating-stuff-to-boring-stuff ratio. Stuff on Oak Island’s Treasure Pit and the (former) names of New York City boroughs and the like. I’m glad it’s still there. For the first time in ages there aren’t enough mathematically-themed comic strips to justify my cutting the week’s roundup in two. No, I have no idea what I’m going to write about for Thursday. Let’s find out together. Jenny Campbell’s Flo and Friends for the 19th faintly irritates me. Flo wants to make sure her granddaughter understands that just because it takes people on average 14 minutes to fall asleep doesn’t mean that anyone actually does, by listing all sorts of reasons that a person might need more than fourteen minutes to sleep. It makes me think of a behavior John Allen Paulos notes in Innumeracy, wherein the statistically wise points out that someone has, say, a one-in-a-hundred-million chance of being killed by a terrorist (or whatever) and is answered, “ah, but what if you’re that one?” That is, it’s a response that has the form of wisdom without the substance. I notice Flo doesn’t mention the many reasons someone might fall asleep in less than fourteen minutes. But there is something wise in there nevertheless. For most stuff, the average is the most common value. By “the average” I mean the arithmetic mean, because that is what anyone means by “the average” unless they’re being difficult. (Mathematicians acknowledge the existence of an average called the mode, which is the most common value (or values), and that’s most common by definition.) But just because something is the most common result does not mean that it must be common. Toss a coin fairly a hundred times and it’s most likely to come up tails 50 times. But you shouldn’t be surprised if it actually turns up tails 51 or 49 or 45 times. This doesn’t make 50 a poor estimate for the average number of times something will happen. It just means that it’s not a guarantee. Gary Wise and Lance Aldrich’s Real Life Adventures for the 19th shows off an unusually dynamic camera angle. It’s in service for a class of problem you get in freshman calculus: find the longest pole that can fit around a corner. Oh, a box-spring mattress up a stairwell is a little different, what with box-spring mattresses being three-dimensional objects. It’s the same kind of problem. I want to say the most astounding furniture-moving event I’ve ever seen was when I moved a fold-out couch down one and a half flights of stairs single-handed. But that overlooks the caged mouse we had one winter, who moved a Chinese finger-trap full of crinkle paper up the tight curved plastic to his nest by sheer determination. The trap was far longer than could possibly be curved around the tube. We have no idea how he managed it. J R Faulkner’s Promises, Promises for the 20th jokes that one could use Roman numerals to obscure calculations. So you could. Roman numerals are terrible things for doing arithmetic, at least past addition and subtraction. This is why accountants and mathematicians abandoned them pretty soon after learning there were alternatives. Mark Anderson’s Andertoons for the 21st is the Mark Anderson’s Andertoons for the week. Probably anything would do for the blackboard problem, but something geometry reads very well. Jef Mallett’s Frazz for the 21st makes some comedy out of the sort of arithmetic error we all make. It’s so easy to pair up, like, 7 and 3 make 10 and 8 and 2 make 10. It takes a moment, or experience, to realize 78 and 32 will not make 100. Forgive casual mistakes. Bud Fisher’s Mutt and Jeff rerun for the 22nd is a similar-in-tone joke built on arithmetic errors. It’s got the form of vaudeville-style sketch compressed way down, which is probably why the third panel could be made into a satisfying final panel too. Bud Blake’s Tiger for the 23rd of February, 2017. I want to blame the colorists for making Hugo’s baby tooth look so weird in the second and third panels, but the coloring is such a faint thing at that point I can’t. I’m sorry to bring it to your attention if you didn’t notice and weren’t bothered by it before. Bud Blake’s Tiger rerun for the 23rd just name-drops mathematics; it could be any subject. But I need some kind of picture around here, don’t I? Mike Baldwin’s Cornered for the 23rd is the anthropomorphic numerals joke for the week. So last week, for schedule reasons, I skipped the Christmas Eve strips and promised to get to them this week. There weren’t any Christmas Eve mathematically-themed comic strips. Figures. This week, I need to skip New Year’s Eve comic strips for similar schedule reasons. If there are any, I’ll talk about them next week. Lorie Ransom’s The Daily Drawing for the 28th is a geometry wordplay joke for this installment. Two of them, when you read the caption. John Graziano’s Ripley’s Believe It or Not for the 28th presents the quite believable claim that Professor Dwight Barkley created a formula to estimate how long it takes a child to ask “are we there yet?” I am skeptical the equation given means all that much. But it’s normal mathematician-type behavior to try modelling stuff. That will usually start with thinking of what one wants to represent, and what things about it could be measured, and how one expects these things might affect one another. There’s usually several plausible-sounding models and one has to select the one or ones that seem likely to be interesting. They have to be simple enough to calculate, but still interesting. They need to have consequences that aren’t obvious. And then there’s the challenge of validating the model. Does its description match the thing we’re interested in well enough to be useful? Or at least instructive? Len Borozinski’s Speechless for the 28th name-drops Albert Einstein and the theory of relativity. Marginal mathematical content, but it’s a slow week. John Allison’s Bad Machinery for the 29th mentions higher dimensions. More dimensions. In particular it names ‘ana’ and ‘kata’ as “the weird extra dimensions”. Ana and kata are a pair of directions coined by the mathematician Charles Howard Hinton to give us a way of talking about directions in hyperspace. They echo the up/down, left/right, in/out pairs. I don’t know that any mathematicians besides Rudy Rucker actually use these words, though, and that in his science fiction. I may not read enough four-dimensional geometry to know the working lingo. Hinton also coined the “tesseract”, which has escaped from being a mathematician’s specialist term into something normal people might recognize. Mostly because of Madeline L’Engle, I suppose, but that counts. Samson’s Dark Side of the Horse for the 29th is Dark Side of the Horse ‘s entry this essay. It’s a fun bit of play on counting, especially as a way to get to sleep. John Graziano’s Ripley’s Believe It or Not for the 29th mentions a little numbers and numerals project. Or at least representations of numbers. Finding other orders for numbers can be fun, and it’s a nice little pastime. I don’t know there’s an important point to this sort of project. But it can be fun to accomplish. Beautiful, even. Mark Anderson’s Andertoons for the 30th relieves us by having a Mark Anderson strip for this essay. And makes for a good Roman numerals gag. Ryan Pagelow’s Buni for the 30th can be counted as an anthropomorphic-numerals joke. I know it’s more of a “ugh 2016 was the worst year” joke, but it parses either way. John Atkinson’s Wrong Hands for the 30th is an Albert Einstein joke. It’s cute as it is, though. Comic Strip Master Command apparently wanted me to have a bunch of easy little pieces that don’t inspire rambling essays. Message received! Samson’s Dark Side Of The Horse is whatever the equivalent of punning is for Roman Numerals. I like Horace blushing. John Deering’s Strange Brew for the 28th is a paint-by-numbers joke, and one I don’t see done often. And there is beauty in the appearance of mathematics. It’s not appreciated enough. I think looking at the tables of integral formulas on the inside back cover of a calculus book should prove the point, though. All those rows of integral signs and sprawls of symbols after show this abstract beauty. I’ve surely mentioned the time when the creative-arts editor for my undergraduate leftist weekly paper asked for a page of mathematics or physics work to include as an picture, too. I used the problem that inspired my “Why Stuff Can Orbit” sequence over on my mathematics blog. The editor loved the look of it all, even if he didn’t know what most of it meant. Niklas Eriksson’s Carpe Diem for the 29th of November, 2016. I’m not sure why this has to be worked out in the break room but I guess you work out life where you do. Anyway, I’m glad to see the Grey Aliens allow for Green Aliens representing them on t-shirts. Niklas Eriksson’s Carpe Diem for the 29th	is a joke about life, I suppose. It uses a sprawled blackboard full of symbols to play the part of the proof. It’s gibberish, of course, although I notice how many mathematics cliches get smooshed into it. There’s a 3.1451 — I assume that’s a garbed digits of π — under a square root sign. There’s an “E = mc”, I suppose a garbled bit of Einstein’s Famous Equation in there. There’s a “cos 360”. 360 evokes the number of degrees in a circle, but mathematicians don’t tend to use degrees. There’s analytic reasons why we find it nicer to use radians, for which the equivalent would be “cos 2π”. If we wrote that at all, since the cosine of 2π is one of the few cosines everyone knows. Every mathematician knows. It’s 1. Well, maybe the work just got to that point and it hasn’t been cleaned up. Eriksson’s Carpe Diem reappears the 30th,	with a few blackboards with less mathematics to suggest someone having a creative block. It does happen to us all. My experience is mathematicians don’t tend to say “Eureka” when we do get a good idea, though. It’s more often some vague mutterings and “well what if” while we form the idea. And then giggling or even laughing once we’re sure we’ve got something. This may be just me and my friends. But it is a real rush when we have it. Niklas Eriksson’s Carpe Diem for the 30th of November, 2016. Maybe he should take a warm bath? Dan Collins’s Looks Good On Paper for the 29t	tells the Möbius strip joke. It’s a well-rendered one, though; I like that there is a readable strip in there and that it’s distorted to fit the geometry. Henry Scarpelli and Craig Boldman’s Archie rerun for the 2nd of December	tosses off the old gag about not needing mathematics now that we have calculators. It’s not a strip about that, and that’s fine. Henry Scarpelli and Craig Boldman’s Archie rerun for the 2nd of December, 2016. Now, not to nitpick, but Jughead and Archie don’t declare it *is* a waste of time to learn mathematics or spelling when a computer can do that work. Also, why don’t we have a word like ‘calculator’ for ‘spell-checker’? I mean, yes, ‘spell-checker’ is an acceptable word, but it’s like calling a ‘calculator’ an ‘arithmetic-doer’. Mark Anderson’s Andertoons finally appeared the 2nd. It’s a resistant-student joke. And a bit of wordplay. Ruben Bolling’s Super-Fun-Pak Comix from the 2nd featured an installment of Tautological But True . One might point out they’re using “average” here to mean “arithmetic mean”. There probably isn’t enough egg salad consumed to let everyone have a median-sized serving. And I wouldn’t make any guesses about the geometric mean serving. But the default meaning of “average” is the arithmetic mean. Anyone using one of the other averages would say so ahead of time or else is trying to pull something. Two things made repeat appearances in the mathematically-themed comics this week. They’re the comic strip Frazz and the idea of having infinitely many monkeys typing. Well, silly answers to word problems also turned up, but that’s hard to say many different things about. Here’s what I make the week in comics out to be. Sandra Bell-Lundy’s Between Friends for the 6th of November, 2016. I’m surprised Bell-Lundy used the broader space of a Sunday strip for a joke that doesn’t need that much illustration, but I understand sometimes you just have to go with the joke that you have. And it isn’t as though Sunday comics get that much space anymore either. Anyway, I suppose we have all been there, although for me that’s more often because I used to have a six-digit pin, and a six-digit library card pin, and those were just close enough to each other that I could never convince myself I was remembering the right one in context, so I would guess wrong. Sandra Bell-Lundy’s Between Friends for the 6th introduces the infinite monkeys problem. I wonder sometimes why the monkeys-on-typewriters thing has so caught the public imagination. And then I remember it encourages us to stare directly into infinity and its intuition-destroying nature from the comfortable furniture of the mundane — typewriters, or keyboards, for goodness’ sake — with that childish comic dose of monkeys. Given that it’s a wonder we ever talk about anything else, really. Monkeys writing Shakespeare has for over a century stood as a marker for what’s possible but incredibly improbable. I haven’t seen it compared to finding a four-digit PIN. It has got me wondering about the chance that four randomly picked letters will be a legitimate English word. I’m sure the chance is more than the one-in-a-thousand chance someone would guess a randomly drawn PIN correctly on one try. More than one in a hundred? I’m less sure. The easy-to-imagine thing to do is set a computer to try out all 456,976 possible sets of four letters and check them against a dictionary. The number of hits divided by the number of possibilities would be the chance of drawing a legitimate word. If I had a less capable computer, or were checking even longer words, I might instead draw some set number of words, never minding that I didn’t get every possibility. The fraction of successful words in my sample would be something close to the chance of drawing any legitimate word. If I thought a little deeper about the problem, though, I’d just count how many four-letter words are already in my dictionary and divide that into 456,976. It’s always a mistake to start programming before you’ve thought the problem out. The trouble is not being able to tell when that thinking-out is done. Richard Thompson’s Poor Richard’s Almanac for the 7th is the other comic strip to mention infinite monkeys. Well, chimpanzees in this case. But for the mathematical problem they’re not different. I’ve featured this particular strip before. But I’m a Thompson fan. And goodness but look at the face on the T S Eliot fan in the lower left corner there. Jeff Mallet’s Frazz for the 6th gives Caulfield one of those flashes of insight that seems like it should be something but doesn’t mean much. He’s had several of these lately, as mentioned here last week. As before this is a fun discovery about Roman Numerals, but it doesn’t seem like it leads to much. Perhaps a discussion of how the subtractive principle — that you can write “four” as “IV” instead of “IIII” — evolved over time. But then there isn’t much point to learning Roman Numerals at all. It’s got some value in showing how much mathematics depends on culture. Not just that stuff can be expressed in different ways, but that those different expressions make different things easier or harder to do. But I suspect that isn’t the objective of lessons about Roman Numerals. Frazz got my attention again the 12th. This time it just uses arithmetic, and a real bear of an arithmetic problem, as signifier for “a big pile of hard work”. This particular problem would be — well, I have to call it tedious, rather than hard. doing it is just a long string of adding together two numbers. But to do that over and over, by my count, at least 47 times for this one problem? Hardly any point to doing that much for one result. Patrick Roberts’s Todd the Dinosaur for the 7th calls out fractions, and arithmetic generally, as the stuff that ruins a child’s dreams. (Well, a dinosaur child’s dreams.) Still, it’s nice to see someone reminding mathematicians that a lot of their field is mostly used by accountants. Actuaries we know about; mathematics departments like to point out that majors can get jobs as actuaries. I don’t know of anyone I went to school with who chose to become one or expressed a desire to be an actuary. But I admit not asking either. Patrick Roberts’s Todd the Dinosaur for the 7th of November, 2016. I don’t remember being talked to by classmates’ parents about what they where, but that might just be that it’s been a long time since I was in elementary school and everybody had the normal sorts of jobs that kids don’t understand. I guess we talked about what our parents did but that should make a weaker impression. Mike Thompson’s Grand Avenue started off a week of students-resisting-the-test-question jokes on the 7th. Most of them are hoary old word problem jokes. But, hey, I signed up to talk about it when a comic strip touches a mathematics topic and word problems do count. Zach Weinersmith’s Saturday Morning Breakfast Cereal reprinted the 7th is a higher level of mathematical joke. It’s from the genre of nonsense calculation. This one starts off with what’s almost a cliche, at least for mathematics and physics majors. The equation it starts with, , is true. And famous. It should be. It links exponentiation, imaginary numbers, π, and negative numbers. Nobody would have seen it coming. And from there is the sort of typical gibberish reasoning, like writing “Pi” instead of π so that it can be thought of as “P times i”, to draw to the silly conclusion that P = 0. That much work is legitimate. From there it sidelines into “P = NP”, which is another equation famous to mathematicians and computer scientists. It’s a shorthand expression of a problem about how long it takes to find solutions. That is, how many steps it takes. How much time it would take a computer to solve a problem. You can see why it’s important to have some study of how long it takes to do a problem. It would be poor form to tie up your computer on a problem that won’t be finished before the computer dies of old age. Or just take too long to be practical. Most problems have some sense of size. You can look for a solution in a small problem or in a big one. You expect searching for the solution in a big problem to take longer. The question is how much longer? Some methods of solving problems take a length of time that grows only slowly as the size of the problem grows. Some take a length of time that grows crazy fast as the size of the problem grows. And there are different kinds of time growth. One kind is called Polynomial, because everything is polynomials. But there’s a polynomial in the problem’s size that describes how long it takes to solve. We call this kind of problem P. Another is called Non-Deterministic Polynomial, for problems that … can’t. We assume. We don’t know. But we know some problems that look like they should be NP (“NP Complete”, to be exact). It’s an open question whether P and NP are the same thing. It’s possible that everything we think might be NP actually can be solved by a P-class algorithm we just haven’t thought of yet. It would be a revolution in our understanding of how to find solutions if it were. Most people who study algorithms think P is not NP. But that’s mostly (as I understand it) because it seems like if P were NP then we’d have some leads on proving that by now. You see how this falls short of being rigorous. But it is part of expertise to get a feel for what seems to make sense in light of everything else we know. We may be surprised. But it would be inhuman not to have any expectations of a problem like this. Mark Anderson’s Andertoons for the 8th gives us the Andertoons content for the week. It’s a fair question why a right triangle might have three sides, three angles, three vertices, and just the one hypotenuse. The word’s origin, from Greek, meaning “stretching under” or “stretching between”. It’s unobjectionable that we might say this is the stretch from one leg of the right triangle to another. But that leaves unanswered why there’s just the one hypothenuse, since the other two legs also stretch from the end of one leg to another. Dr Sarah on The Math Forum suggests we need to think of circles. Draw a circle and a diameter line on it. Now pick any point on the circle other than where the diameter cuts it. Draw a line from one end of the diameter to your point. And from your point to the other end of the diameter. You have a right triangle! And the hypothenuse is the leg stretching under the other two. Yes, I’m assuming you picked a point above the diameter. You did, though, didn’t you? Humans do that sort of thing. I don’t know if Dr Sarah’s explanation is right. It sounds plausible and sensible. But those are weak pins to hang an etymology on. But I have no reason to think she’s mistaken. And the explanation might help people accept there is the one hypothenuse and there’s something interesting about it. The first (and as I write this only) commenter, Kristiaan, has a good if cheap joke there. As mentioned, the lottery was a big thing a couple of weeks ago. So there were a couple of lottery-themed comics recently. Let me group them together. Comic strips tend to be anti-lottery. It’s as though people trying to make a living drawing comics for newspapers are skeptical of wild long-shot dreams. T Lewis and Michael Fry’s Over The Hedge started a lottery storyline the 1st of February. Verne, the turtle, repeats the tired joke that the lottery is a tax on people bad at mathematics. Enormous jackpots, like the $1,500,000,000 payout of a couple weeks back, break one leg of the anti-lottery argument. If the expected payout is large enough then the expectation value of playing can become positive. The expectation value is one of those statistics terms that almost tells you what it is just by the name. It’s what you would expect as the average result if you could repeat some experiment arbitrarily many times. If the payout is 1.5 billion, and the chance of winning one in 250 million, then the expected value of the payout is six dollars. If a ticket costs less than six dollars, then — if you could play over and over, hundreds of millions of times — you’d expect to come out ahead each time you play. If you could. Of course, you can’t play the lottery hundreds of millions of times. You can play a couple of times at most. (Even if you join a pool at work and buy, oh, a thousand tickets. That’s still barely better than playing twice.) And the payout may be less than the full jackpot; multiple winners are common things in the most enormous jackpots. Still, if you’re pondering whether it’s sensible to spend two dollars on a billion-dollar lottery jackpot? You’re being fussy. You’ll spend at least that much on something more foolish and transitory — the lottery ticket can at least be used as a bookmark — I’ll bet. Jef Mallett’s Frazz for the 4th of February picks up the anti-lottery crusade. Caulfield does pin down that lotteries work because people figure they have a better chance of winning than they truly do. Nobody buys a ticket because they figure it’s worth losing a dollar or two. It’s because they figure the chance is worth a little money. Ken Cursoe’s Tiny Sepuku for the 4th of February consults the Chinese Zodiac Monkey for help on finding lucky numbers. There’s not really any finding them. Lotteries work hard to keep the winning numbers as unpredictable as possible. I have heard the lore that numbers up to 31 are picked by more people — they’re numbers that can be birthdays — so that multiple winners on the same drawing are more likely. I don’t know that this is true, though. I suspect that I could feel comfortable even with a four-way split of one and a half billions of dollars. Five-way would be out of the question, of course. Better to tear up the ticket than take that undignified split. In Rick Detorie’s One Big Happy for the 3rd of February, 2016. The link will probably expire in early March. In Rick Detorie’s One Big Happy for the 3rd of February features Ruthie tossing off a confusing pile of numbers on the way to declaring herself bad at mathematics. It’s always the way. Breaking up a whole number like 4 into different sums of whole numbers is a mathematics problem also. Splitting up 4 into, say, ‘2 plus 1 plus 1’, is a ‘partition’ of the number. I’m not sure of important results that follow this sort of integer partition directly. But splitting up sets of things different ways runs through a lot of mathematics. Integer partitions are the ones you can do in elementary school. Percy Crosby’s Skippy for the 3rd of February — I believe it originally ran December 1928 — is a Roman numerals joke. The mathematical content may be low, but what the heck. It’s kind of timely. The Super Bowl, set for today, has been the most prominent use of Roman numerals we have anymore since the Star Trek movies stopped using them a quarter-century ago. Bill Amend’s FoxTrot for the 7th of February seems to be in agreement. And yes, I’m disappointed the Super Bowl is giving up on Roman numerals, much the way I’m disappointed they’re using a standardized and quite boring logo for each year. Part of the glory of past Super Bowls is seeing old graphic design eras preserved like fossils. Brian Gordon’s Fowl Language for the 5th of February shows a duck trying to explain incredibly huge numbers to his kid. It’s hard. You need to appreciate mathematics some to start appreciating real vastness. I’m not sure anyone can really have a feel for a number like 300 sextillion, the character’s estimate for the number of stars there are. You can make rationalizations for what numbers that big are like, but I suspect the mind shies back from staring directly at it. Infinity, and the many different sizes of infinity, might be easier to work with. One doesn’t need to imagine infinitely many things to work out the properties of infinitely large sets. You could do as well with a neatly drawn rectangle and some other, bigger, rectangles. But if you want to talk about the number 300,000,000,000,000,000,000,000 then you do want to think of something true about that number which isn’t also true about eight or about nine hundred million. But geology teaches us to ponder Deep Time. Astronomy trains us to imagine incredibly vast distances. Why not spend some time pondering huge numbers? And with all that said, I’d like to make one more call for any requests for my winter 2016 Mathematics A To Z glossary. There are quite a few attractive letters left unclaimed; a word or short term could be yours! Brian Fies’s Mom’s Cancer is a heartbreaking story. It’s compelling reading, but people who are emotionally raw from lost love ones, or who know they’re particularly sensitive to such stories, should consider before reading that the comic is about exactly what the title says. But it belongs here because in the October 29th and the November 2nd installments are about a curiosity of area, and volume, and hypervolume, and more. That is that our perception of how big a thing is tends to be governed by one dimension, the length or the diameter of the thing. But its area is the square of that, its volume the cube of that, its hypervolume some higher power yet of that. So very slight changes in the diameter produce great changes in the volume. Conversely, though, great changes in volume	will look like only slight changes. This can hurt. Tom Toles’s Randolph Itch, 2 am from the 29th of October is a Roman numerals joke. I include it as comic relief. The clock face in the strip does depict 4 as IV. That’s eccentric but not unknown for clock faces; IIII seems to be more common. There’s not a clear reason why this should be. The explanation I find most nearly convincing is an aesthetic one. Roman numerals are flexible things, and can be arranged for artistic virtue in ways that Arabic numerals make impossible. The aesthetic argument is that the four-character symbol IIII takes up nearly as much horizontal space as the VIII opposite it. The two-character IV would look distractingly skinny. Now, none of the symbols takes up exactly the same space as their counterpart. X is shorter than II, VII longer than V. But IV-versus-VIII does seem like the biggest discrepancy. Still, Toles’s art shows it wouldn’t look all that weird. And he had to conserve line strokes, so that the clock would read cleanly in newsprint. I imagine he also wanted to avoid using different representations of “4” so close together. Jon Rosenberg’s Scenes From A Multiverse for the 29th of October is a riff on both quantum mechanics — Schödinger’s Cat in a box — and the uncertainty principle. The uncertainty principle can be expressed as a fascinating mathematical construct. It starts with Ψ, a probability function that has spacetime as its domain, and the complex-valued numbers as its range. By applying a function to this function we can derive yet another function. This function-of-a-function we call an operator, because we’re saying “function” so much it’s starting to sound funny. But this new function, the one we get by applying an operator to Ψ, tells us the probability that the thing described is in this place versus that place. Or that it has this speed rather than that speed. Or this angular momentum — the tendency to keep spinning — versus that angular momentum. And so on. If we apply an operator — let me call it A — to the function Ψ, we get a new function. What happens if we apply another operator — let me call it B — to this new function? Well, we get a second new function. It’s much the way if we take a number, and multiply it by another number, and then multiply it again by yet another number. Of course we get a new number out of it. What would you expect? This operators-on-functions things looks and acts in many ways like multiplication. We even use symbols that look like multiplication: AΨ is operator A applied to function Ψ, and BAΨ is operator B applied to the function AΨ. Now here is the thing we don’t expect. What if we applied operator B to Ψ first, and then operator A to the product? That is, what if we worked out ABΨ? If this was ordinary multiplication, then, nothing all that interesting. Changing the order of the real numbers we multiply together doesn’t change what the product is. Operators are stranger creatures than real numbers are. It can be that BAΨ is not the same function as ABΨ. We say this means the operators A and B do not commute. But it can be that BAΨ is exactly the same function as ABΨ. When this happens we say that A and B do commute. Whether they do or they don’t commute depends on the operators. When we know what the operators are we can say whether they commute. We don’t have to try them out on some functions and see what happens, although that sometimes is the easiest way to double-check your work. And here is where we get the uncertainty principle from. The uncertainty principle is a great source for humor, and for science fiction. It seems to allow for all kinds of magic. Its reality is no less amazing, though. For example, it implies that it is impossible for an electron to spiral down into the nucleus of an atom, collapsing atoms the way satellites eventually fall to Earth. Matter can exist, in ways that let us have solid objects and chemistry and biology. This is at least as good as a cat being perhaps boxed. Jan Eliot’s Stone Soup Classics for the 29th of October is a rerun from 1995. (The strip itself has gone to Sunday-only publication.) It’s a joke about how arithmetic is easy when you have the proper motivation. In 1995 that would include catching TV shows at a particular time. You see, in 1995 it was possible to record and watch TV shows when you wanted, but it required coordinating multiple pieces of electronics. It would often be easier to just watch when the show actually aired. Today we have it much better. You can watch anything you want anytime you want, using any piece of consumer electronics you have within reach, including several current models of microwave ovens and programmable thermostats. This does, sadly, remove one motivation for doing arithmetic. Also, I’m not certain the kids’ TV schedule is actually consistent with what was on TV in 1995. Oh, heck, why not. Obviously we’re 14 minutes before the hour. Let me move onto the hour for convenience. It’s 744 minutes to the morning cartoons; that’s 12.4 hours. Taking the morning cartoons to start at 8 am, that means it’s currently 14 minutes before 24 minutes before 8 pm. I suspect a rounding error. Let me say they’re coming up on 8 pm. 194 minutes to Jeopardy implies the game show is on at 11 pm. 254 minutes to The Simpsons puts that on at midnight, which is probably true today, though I don’t think it was so in 1995 just yet. 284 minutes to Grace puts that on at 12:30 am. I suspect that Eliot wanted it to be 978 minutes to the morning cartoons, which would bump Oprah to 4:00, Jeopardy to 7:00, Simpsons and Grace to 8:00 and 8:30, and still let the cartoons begin at 8 am. Or perhaps the kids aren’t that great at arithmetic yet. Stephen Beals’s Adult Children for the 30th of October tries to build a “math error” out of repeated use of the phrase “I couldn’t care less”. The argument is that the thing one cares least about is unique. But why can’t there be two equally least-cared-about things? We can consider caring about things as an optimization problem. Optimization problems are about finding the most of something given some constraints. If you want the least of something, multiply the thing you have by minus one and look for the most of that. You may giggle at this. But it’s the sensible thing to do. And many things can be equally high, or low. Take a bundt cake pan, and drizzle a little water in it. The water separates into many small, elliptic puddles. If the cake pan were perfectly formed, and set on a perfectly level counter, then the bottom of each puddle would be at the same minimum height. I grant a real cake pan is not perfect; neither is any counter. But you can imagine such. Just because you can imagine it, though, must it exist? Think of the “smallest positive number”. The idea is simple. Positive numbers are a set of numbers. Surely there’s some smallest number. Yet there isn’t; name any positive number and we can name a smaller number. Divide it by two, for example. Zero is smaller than any positive number, but it’s not itself a positive number. A minimum might not exist, at least not within the confines where we are to look. It could be there is not something one could not care less about. So a minimum might or might not exist, and it might or might not be unique. This is why optimization problems are exciting, challenging things. Niklas Eriksson’s Carpe Diem for the 1st of November, 2015. I’m not sure how accurately the art depicts bedbugs, although I’m also not sure how accurately Eriksson should. Niklas Eriksson’s Carpe Diem for the 1st of November is about understanding the universe by way of observation and calculation. We do rely on mathematics to tell us things about the universe. Immanuel Kant has a bit of reputation in mathematical physics circles for this observation. (I admit I’ve never seen the original text where Kant observed this, so I may be passing on an urban legend. My love has several thousands of pages of Kant’s writing, but I do not know if any of them touch on natural philosophy.) If all we knew about space was that gravitation falls off as the square of the distance between two things, though, we could infer that space must have three dimensions. Otherwise that relationship would not make geometric sense. Jeff Harris’s kids-information feature Shortcuts for the 1st of November was about the Harvard Computers. By this we mean the people who did the hard work of numerical computation, back in the days before this could be done by electrical and then electronic computer. Mathematicians relied on people who could do arithmetic in those days. There is the folkloric belief that mathematicians are inherently terrible at arithmetic. (I suspect the truth is people assume mathematicians must be better at arithmetic than they really are.) But here, there’s the mathematics of thinking what needs to be calculated, and there’s the mathematics of doing the calculations. Their existence tends to be mentioned as a rare bit of human interest in numerical mathematics books, usually in the preface in which the author speaks with amazement of how people who did computing were once called computers. I wonder if books about font and graphic design mention how people who typed used to be called typewriters in their prefaces. My edition name sounds cranky and I’m sorry for that. But the fact is a couple of the comics in this roundup did things that irritated me. I hope you don’t think worse of me when you’ve heard why they made me cranky. Patrick Roberts’s Todd the Dinosaur for the 31st of July, 2015. Patrick Roberts’s Todd the Dinosaur (July 31) is a riff on the infinite-monkey problem, often discussed in the comics. Todd isn’t quite into the perfect randomness that the thought experiment wants. The strip does make me wonder if there have been any variations on the infinite monkey problem in which, instead of a series of randomly typed characters, random words are picked instead. On the one hand, there are many more possible words than there are letters every time something is to be typed. On the other hand, obvious nonsense like ‘gazurlnikov’ won’t turn up. But it’s easier to imagine a keyboard than it is a random pick of all the words in the language. Lorie Ransom’s Daily Drawing (July 31) is some compass and protractor wordplay. Protractors aren’t part of the classical set of tools used for geometric proofs — compasses and straightedges alone do it — although they are convenient things to have. And they can be used to confirm hunches or refute possibilities, in much the same way trying out a specific case of a problem can guide one to solving a general problem. Tony Carillo’s F Minus (August 1) makes a joke that I admit I don’t quite get. I think it’s trying to say that you get better pay with more mathematics training. That ought to be a nice affirmation of my chosen field’s value, although it comes across to me as snotty. For one, typically, more training in any field correlates with higher salaries. It’s not some magic that only mathematics has. For another, salary is not the measure of the worth of something, nor should it be. Tom Thaves’s Frank and Ernest (August 1) tries to use up the mathematics puns for this installment. Steve Breen and Mike Thompson’s Grand Avenue (August 2) is another entry in the “kids refusing mathematics for summer break” string of comics. And, of course, the kids display an ironic understanding of probability while trying to avoid Grandma’s mathematics workbooks. I’m on the kids’ side here, by the way. Previous summer installments have shown Grandma making the kids do tedious, boring, repetitive calculations that make me, now, not want to do mathematics. It’s in the name of getting them back in practice before the school year starts, but as depicted, it’s an attempt to crush all the joy of mathematics. At least working out best ways to hide is a use of probability that has some clear purpose and some fun to it. The daily strips for this week seem to be going in a different direction. Dave Coverly’s Speed Bump (August 2) makes me wonder something I never thought about before. Would Romans see the symbols I, V, X, and so on as “one” and “five” and “ten” and so on? I mean, certainly they would in contexts where a number was expected. But if they just encountered the symbol without context, would they read it as the letter or as the number? I rate this as my favorite of this set of strips because it has given me something so fresh to ponder. I do like looking for thematic links among the comic strips that mention mathematical topics that I gather for these posts. This time around all I can find is a theme of “nothing big going on”. I’m amused by some of them but don’t think there’s much depth to the topics. But I like them anyway. Mark Anderson’s Andertoons gets its appearance here with the May 25th strip. And it’s a joke about the hatred of fractions. It’s a suitable one for posting in mathematics classes too, since it is right about naming three famous irrational numbers — pi, the “golden ratio” phi, and the square root of two — and the fact they can’t be written as fractions which use only whole numbers in the numerator and denominator. Pi is, well, pi. The square root of two is nice and easy to find, and has that famous legend about the Pythagoreans attached to it. And it’s probably the easiest number to prove is irrational. The “golden ratio” is that number that’s about 1.618. It’s interesting because 1 divided by phi is about 0.618, and who can resist a symmetry like that? That’s about all there is to say for it, though. The golden ratio is otherwise a pretty boring number, really. It’s gained celebrity as an “ideal” ratio — that a rectangle with one side about 1.6 times as long as the other is somehow more appealing than other choices — but that’s rubbish. It’s a novelty act among numbers. Novelty acts are fun, but we should appreciate them for what they are. This week’s bundle of mathematics-themed comic strips has a pretty nice blend, to my tastes: about half of them get at good and juicy topics, and about half are pretty quick and easy things to describe. So, my thanks to Comic Strip Master Command for the distribution. Bill Watterson’s Calvin and Hobbes (December 1, rerun)	slips in a pretty good probability question, although the good part is figuring out how to word it: what are the chances Calvin’s Dad was thinking of 92,376,051 of all the possible numbers out there? Given that there’s infinitely many possible choices, if every one of them is equally likely to be drawn, then the chance he was thinking of that particular number is zero. But Calvin’s Dad couldn’t be picking from every possible number; all humanity, working for its entire existence, will only ever think of finitely many numbers, which is the kind of fact that humbles me when I stare too hard at it. And people, asked to pick a number, have ones they prefer: 37, for example, or 17. Christopher Miller’s American Cornball: A Laffopedic Guide To The Formerly Funny (a fine guide to jokes that you see lingering around long after they were actually funny) notes that what number people tend to pick seems to vary in time, and in the early 20th century 23 was just as funny a number as you could think of on a moment’s notice. Zach Weinersmith’s Saturday Morning Breakfast Cereal (December 1)	is entitled “how introductory physics problems are written”, and yeah, that’s about the way that a fair enough problem gets rewritten so as to technically qualify as a word problem. I think I’ve mentioned my favorite example of quietly out-of-touch word problems, a 1970s-era probability book which asked the probability of two out of five transistors in a radio failing. That was blatantly a rewrite of a problem about a five-vacuum-tube radio (my understanding is many radios in that era used five tubes) and each would have a non-negligible chance of failing on any given day. But that’s a slightly different problem, as the original question would have made good sense when it was composed, and it only in the updating became ridiculous. Julie Larson’s The Dinette Set (December 2)	illustrates one of the classic sampling difficulties: how can something be generally true if, in your experience, it isn’t? If you make the reasonable assumption that there’s nothing exceptional about you, then, shouldn’t your experience of, say, fraction of people who exercise, or average length of commute, or neighborhood crime rate be tolerably close to what’s really going on? You could probably build an entire philosophy-of-mathematics course around this panel before even starting the question of how do you get a fair survey of a population. Scott Hilburn’s The Argyle Sweater (December 3)	tells a Roman numeral joke that actually I don’t remember encountering before. Huh. Samson’s Dark Side Of The Horse (December 3)	does some play with mathematical symbols and of course I got distracted by thinking what kind of problem Horace was working on in the first panel; it looks obvious to me that it’s something about the orbit of one body around another. In principle, it might be anything, since the great discovery of algebra is that you can replace numbers with symbols like “a” and work out relations without having to know anything about them. “G”, for example, tends to mean the gravitational constant of the universe, and “GM” makes this identification almost certain: gravitation problems need the masses of a main body, like a planet, and a smaller body, like a satellite, and that’s usually represented as either m1 and m2 or as M and m.
In orbital mechanics problems, “a” often refers to the semimajor axis — the long diameter of the ellipse the orbiting body makes — and “e” the eccentricity — a measure of how close to a circle the ellipse is (an eccentricity of zero means it’s a circle — but the fact that there’s subscripts of k makes that identification suspect: subscripts are often used to distinguish which of multiple similar things you mean to talk about, and if it’s just one body orbiting the other there’s no need for that. So what is Horace working on? The answer is: Horace is working on an orbital perturbation problem, describing how far from the true circular orbit a satellite will drift when you consider things like atmospheric drag and the slightly non-spherical shape of the Earth. ak is still a semi-major axis and ek the eccentricity, but of the little changes from the original orbit, rather than the original orbit themselves. And now I wonder if Samson plucked the original symbol just because it looked so graphically pleasant, or if Samson was slipping in a further joke about the way an attractive body will alter another body’s course. Jenny Campbell’s Flo and Friends (December 4)	offers a less exciting joke: it’s a simple word problem joke, playing on the ambiguity of “calculate how many seconds there are in the year”. Now, the dull way to work this out is to multiply 60 seconds per minute times 60 minutes per hour times 24 hours per day times 365 (or 365.25, or 365.2422 if you want to start that argument) days per year. But we can do almost as well and purely in our heads, if we remember that a million seconds is almost twelve days long. How many twelve-day stretches are there in a year? Well, right about 31 — after all, the year is (nearly) 12 groups of 31 days, and therefore it’s also 31 groups of 12 days. Therefore the year is about 31 million seconds long. If we pull out the calculator we find that a 365-day year is 31,536,000 seconds, but isn’t it more satisfying to say “about 31 million seconds” like we just did? John Deering’s Strange Brew (December 4)	took me the longest time to work out what the joke was supposed to be. I’m still not positive but I think it’s just one colleague sneering at the higher mathematics of another. Patrick Roberts’s Todd the Dinosaur (December 5)	discovers there are numbers bigger than 2. Patrick Roberts’s Todd the Dinosaur (December 5)	discovers that some numbers are quite big ones, actually. There is a challenge in working with really big numbers, even if they’re usually bigger than 2. Usually we’re not interested in a number by itself, and would rather do some kind of calculation with it, and that’s boring to do too much of, but a computer can only work with so many digits at once. The average computer uses floating point arithmetic schemes which will track, at most, about 19 decimal digits, on the reasonable guess that twenty decimal digits is the difference between 3.1415926535897932384 and 3.1415926535897932385 and how often is that difference — a millionth of a millionth of a millionth of a percent — going to matter? If it does, then, you do the kind of work that gets numerical mathematicians their big paydays: using schemes that work with more digits, or chopping up a problem so that you never have to use all 86 relevant digits at once, or rewriting your calculation so that you don’t need so many digits of accuracy all at once. Daniel Beyer’s Offbeat Comics (December 5) gives four ways to represent the number 4. Five, if you count the caption. 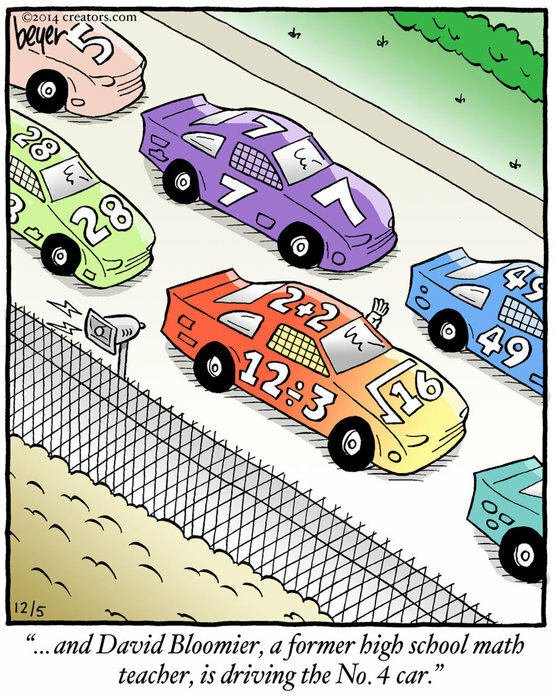 Daniel Beyer’s Offbeat Comics (December 5)	gives a couple of ways to express the number 4 — including, look closely, holding up fingers — as part of a joke about the driver being a former mathematics teacher. Greg Cravens’s The Buckets (December 5)	is the old, old, old joke about never using algebra in real life. Do English teachers get this same gag about never using the knowledge of how to diagram sentences? In any case, I did use my knowledge of sentence-diagramming, and for the best possible application: I made fun of a guy on the Internet with it. I advise against reading the comments — I mean, that’s normally good advice, but comic strips attract readers who want to complain about how stupid kids are anymore and strips that mention education give plenty of grounds for it — but I noticed one of the early comments said “try to do any repair at home without some understanding of it”. I like the claim, but, I can’t think of any home repair I’ve done that’s needed algebra. The most I’ve needed has been working out the area of a piece of plywood I needed, but if multiplying length by width is algebra than we’ve badly debased the term. Even my really ambitious project, building a PVC-frame pond cover, isn’t going to be one that uses algebra unless we take an extremely generous view of the subject. I hope everyone’s been well. I was on honeymoon the last several weeks and I’ve finally got back to my home continent and new home so I’ll try to catch up on the mathematics-themed comics first and then plunge into new mathematics content. I’m splitting that up into at least two pieces since the comics assembled into a pretty big pile while I was out. And first, I want to offer the link to the July 2 Willy and Ethel, by Joe Martin, since even though I offered it last time I didn’t have a reasonably permanent URL for it. I had another little occasion to reflect on the ways of representing numbers, as well as the chance to feel a bit foolish, this past weekend so I’m naturally driven to share it. This came about on visiting the Silverball Museum, a pinball museum, or arcade, in Asbury Park, New Jersey. (I’m not sure the exact difference between a museum in which games are playable by visitors and an arcade, except for the signs affixed to nearly all the games.) Naturally I failed to bring my camera, so I can’t easily show what I had in mind; too bad. Pinballs, at least once they got around to having electricity installed, need to show the scores. Since about the mid-1990s these have been shown by dot matrix displays, which are pretty easy to read — the current player’s score can be shown extremely large, for example — and make it easy for the game to go into different modes, where the scoring and objectives of play vary for a time. From about the mid-1970s to the mid-1990s eight-segment light-emitting diodes were preferred, for that “small alarm clock” look. And going before that were rotating number wheels, which are probably the iconic look to pinball score boards, to the extent anyone thinks of a classic pinball machine in that detail. But there’s another score display, which I must admit offends my sense of order. In this, which I noticed mostly in the machines from the 1950s, with a few outliers in the early 60s (often used in conjunction with the rotating wheels), the parts of the number are broken apart, and the score is read by adding up the parts which are lit up. The machine I was looking at had one column of digits for the millions, another for hundreds of thousands, and then another with two-digit numbers. What Are Numbers Made Of? To return to my second major theme: my Dearly Beloved told me that I must explain that trick where one adds up the digits of a number and finds out from that whether it’s divisible by 9. I wanted to anyway, but a request like that is irresistible. The answer can be given quickly — and several of my hopefully faithful readers did, in comments, last Friday — but I’d like to take the long way around because I do that and because it lets a lot of other interesting divisibility properties show themselves. We use ten numerals and the place where we write them to express all the counting numbers out there. We put one of the numerals, such as `2′, in a place which denotes whether we mean to say two tens, or two hundreds, or two millions. That’s a clever tool, and not one inherent to the idea of numbers. We could as easily use different symbols for different magnitudes; the only familiar example of this (in the west) is Roman numerals, where we use I, X, C, and M for increasing powers of ten, and then notice we aren’t really quite sure what to do past M.
The Romans were not very sure either, and individual variations developed when someone found they needed to express an M of M very often. The system has fewer numerals, symbols representing numbers, than ours does, with V and L and D the only additional numerals reasonably common. By the Middle Ages some symbols were improvised to allow for extremely large numbers such as the hundred thousands, and some extra symbols were pulled in for numbers such as 7 or 40, but they have faded to the point of obscurity. This is a numbering system which runs out when the numbers get too large, which seems impossibly limited at first glance. But we haven’t changed much from these times: while we have a numbering system that can, in principle, work with arbitrarily big or tiny numbers, in practice we only use a small range of them. When we turn over arithmetic to computers, in fact, we accept numbering systems which have limits on how big (positive or negative) a number may be, or how close to zero one may work. We accept those limits because of their convenience and are only sometimes annoyed to find, for example, that the spreadsheet trying to calculate a bill has decided we want 0.9999999 of a penny. Author Joseph NebusPosted on Saturday, 15 October, 2011 Categories Math, Modular ArithmeticTags calendar, in-joke, Mayan Long Count, numerals, numerical base, Roman numerals2 Comments on What Are Numbers Made Of?